The Blob storage service in Azure Storage is one of several Azure-based origins integrated with Azure Content Delivery Network (CDN). Any publicly accessible blob content can be cached in Azure CDN until its time-to-live (TTL) elapses. The TTL is determined by the Cache-Control header in the HTTP response from the origin server. 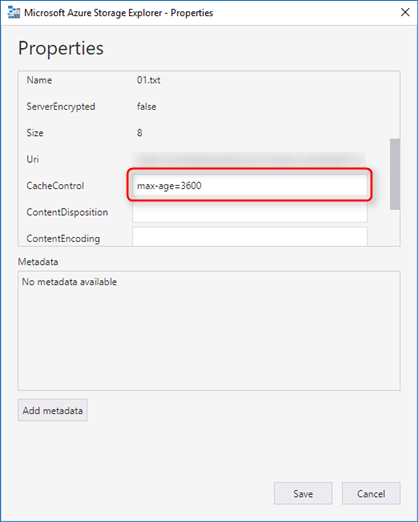 This article describes several ways that you can set the Cache-Control header on a blob in Azure Storage. You can also control cache settings from the Azure portal by setting CDN caching rules. If you create a caching rule and set its caching behavior to Override or Bypass cache, the origin-provided caching settings discussed in this article are ignored. For information about general caching concepts, see How caching works. You can choose to set no TTL on a blob. In this case, Azure CDN automatically applies a default TTL of seven days, unless you have set up caching rules in the Azure portal. This default TTL applies only to general web delivery optimizations. For large file optimizations, the default TTL is one day, and for media streaming optimizations, the default TTL is one year. For more information about how Azure CDN works to speed up access to blobs and other files, see Overview of the Azure Content Delivery Network. For more information about Azure Blob storage, see Introduction to Blob storage. The preferred method for setting a blob's Cache-Control header is to use caching rules in the Azure portal. 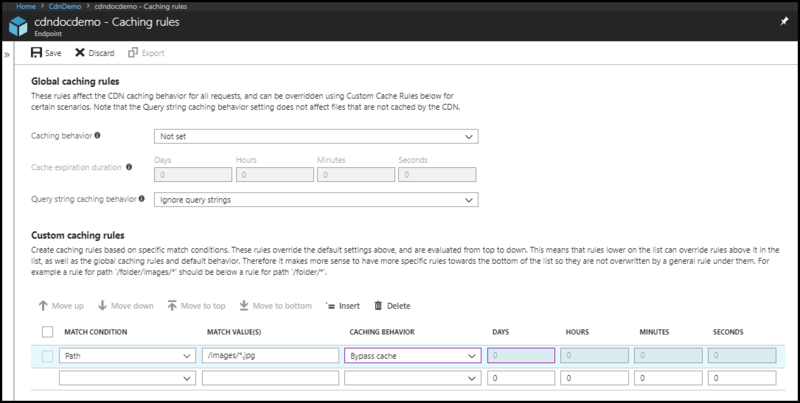 For more information about CDN caching rules, see Control Azure CDN caching behavior with caching rules. In the Azure portal, select a CDN profile, then select the endpoint for the blob. Under Global caching rules, set Query string caching behavior to Ignore query strings and set Caching behavior to Override. For Cache expiration duration, enter 3600 in the Seconds box or 1 in the Hours box. This global caching rule sets a cache duration of one hour and affects all requests to the endpoint. It overrides any Cache-Control or Expires HTTP headers that are sent by the origin server specified by the endpoint. A. For the first match condition, set Match condition to Path and enter /blobcontainer1/* for Match value. Set Caching behavior to Override and enter 4 in the Hours box. B. For the second match condition, set Match condition to Path and enter /blobcontainer1/blob1.txt for Match value. Set Caching behavior to Override and enter 2 in the Hours box. The first custom caching rule sets a cache duration of four hours for any blob files in the /blobcontainer1 folder on the origin server specified by your endpoint. The second rule overrides the first rule for the blob1.txt blob file only and sets a cache duration of two hours for it. Azure PowerShell is one of the quickest and most powerful ways to administer your Azure services. Use the Get-AzStorageBlob cmdlet to get a reference to the blob, then set the .ICloudBlob.Properties.CacheControl property. $context = New-AzStorageContext -StorageAccountName "<storage account name>" -StorageAccountKey "<storage account key>"
$blob = Get-AzStorageBlob -Context $context -Container "<container name>" -Blob "<blob name>"
You can also use PowerShell to manage your CDN profiles and endpoints. To specify a blob's Cache-Control header by using .NET code, use the Azure Storage Client Library for .NET to set the CloudBlob.Properties.CacheControl property. // Create a blob client for interacting with the blob service. There are more .NET code samples available in Azure Blob Storage Samples for .NET. With Azure Storage Explorer, you can view and edit your blob storage resources, including properties such as the CacheControl property. Select a blob, then select Properties from the context menu. Scroll down to the CacheControl property. Enter a value, then select Save. You can easily verify the TTL settings of your blobs. With your browser's developer tools, test that your blob includes the Cache-Control response header. You can also use a tool such as Wget, Postman, or Fiddler to examine the response headers.